Given a molecule, can we identify all of its tautomeric forms? Given a list of tautomeric forms, how do we identify the most "preferrable" form? Next, a tautomeric form is generated for each unique alternating path of double-single bonds between a hydrogen donor-acceptor atom pair by considering the parity of the path. Care should be taken to handle overlapping paths. Since this approach does not follow any specific patterns, there is no limit to the distance of the shift. 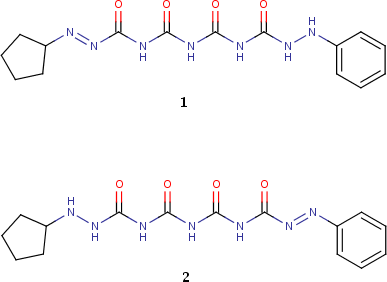 For example, consider the following two molecules (taken from Fig. 15 of this paper): Since what we have is a 1,11-shift, it's unlikely that a typical local approach will be able to resolve 1 and 2 as two different tautomeric forms of the same molecule. The global approach, on the other hand, is able to handle this "hidden" tautomerism without a problem. To address the most "preferrable" tautomeric form, we extend the tautomer scoring scheme as described here. This scoring scheme, in turn, is used to rank each generated tautomer. The one with the highest score is selected as the canonical tautomer. 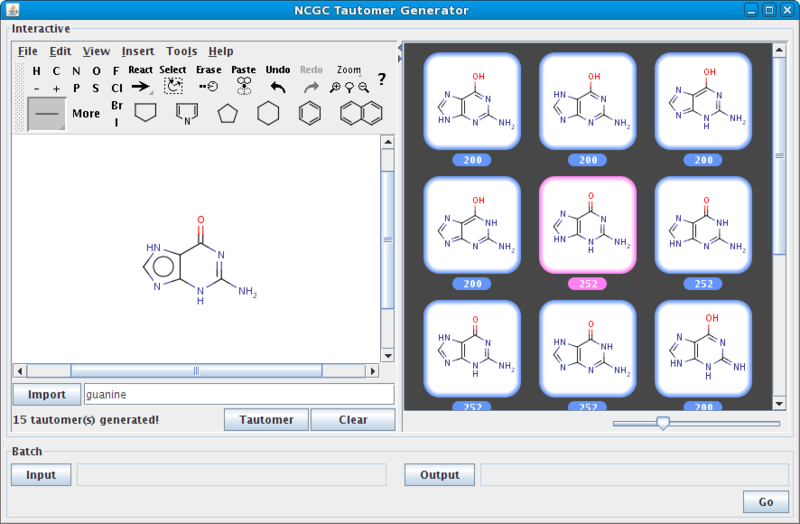 Below is a quick look at the tautomer generation tool. Currently, the maximum number tautomers generated is limited to 1000. In the snapshot, the canonical tautomer is highlighted in pink. As always, we appreciate any feedback that would help us improve on our implementation.